Dr. Krishnan is the director of The Healthy Sleep™ – Advanced Center for Snoring, Sleep Apnea and Migraine Therapy. This is the first such center in India providing Oral appliance treatment for Snoring and Sleep Apnea. He is involved in treating snoring / sleep apnea since 2001. Dr. Krishnan is a 3rd generation allopathic doctor in his family. His grandfather, late Dr. A. S. Vaidyanatha Iyer, chose to settle down at Thalassery, when he was posted there under the British regime in 1918 and was well known for his medical skills. His father, late Dr. A. V. Subramanian, had his medical education at Stanley Medical College (SMC), Chennai and specialization in Ophthalmology. He was in private practice since 1948, after a brief stint under the British Medical Service during World War II, for over 5 decades until 2001, when he retired from practice due to ill health. Dr. Krishnan is now carrying forward the yeoman service done by his family for almost a century. Dr. Krishnan completed his secondary school education at St. Joseph’s Boys, High School, Thalassery and was a National Merit Scholar. He graduated in Chemistry from Sree Narayana College, Kannur, Kerala with a first class. To accomplish his passion for healthcare, Dr. Krishnan enrolled for graduate course in Dental Surgery at the prestigious Manipal College of Dental Sciences [MCODS], Mangalore, in its very first batch in 1987. 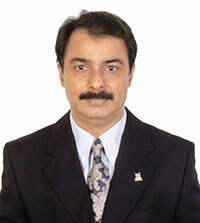 He successfully completed rotating internship in various dental specialties in 1992. Further, he acquired specialized skills in Root Canal Treatment and Restorative Dentistry under his eminent professor, late Dr. Premanand Kamath, when he worked as a lecturer in MCODS. To broaden his skills in Crowns & Bridges and Complete Dentures, he worked under the renowned Prosthodontist, Dr. Mathai Joseph Kattookaren at his private practice in Kannur, Kerala. Having acquired the latest science and technology in dentistry, in January 1995 Dr. Krishnan launched the state-of-the-art dental hospital, The Tooth Clinic – for Total Dental Care, at Thalassery, Kerala. It is a unique for the excellent quality of treatment, no-compromise instrument sterilisation, clean & nature-friendly environment and above all the marvelous patient care. Dr. Krishnan updates his skills and knowledge regularly by attending continuing education programs, nationally and internationally. He has recently trained in EndoMagic Rotary Files System for Single visit Root Canal Treatment under Dr. Arthur Kit Weathers at Las Vegas Institute for Advanced Dental Studies, Las Vegas, USA. Hailing from this land where cricket was first played in India, Dr. Krishnan’s keen interest in preventing sports-related facial injuries led him to the 1st International Congress on Dentistry and Sports at Cologne, Germany in 2001, where he trained in fabrication of custom mouthguards by the International Olympic Committee Medical Commission. He is the India representative of International Society of Dentistry, Sport and Trauma. He was a delegate in the 2nd Sports Dentistry Congress at Berne, Switzerland in 2002. He spoke on “Dento-facial Injuries in Cricket & their prevention” at the 2nd World Congress on Science and Medicine in Cricket hosted by International Cricket Council along with Cricket World Cup at Cape Town, South Africa in 2003. Dr. Krishnan had his early training in Dental Sleep Medicine at Germany in 2001. He took advanced training in treating sleep breathing disorders at Las Vegas Institute for Advanced Dental Studies, Las Vegas, USA and courses with American Academy of Dental Sleep Medicine in 2008. He is a certified provider of DNA Appliance System, for non-surgical airway remodeling. He is a member of American Academy of Dental Sleep Medicine, life member of Indian Sleep Disorders Association and Indian Society for Sleep Research. He has been teaching at the National Sleep Medicine Course since 2010 and a faculty at the ISDA annual conferences. He has attended American Academy of Dental Sleep Medicine & American Academy of Sleep Medicine conferences at San Antonio in 2010 and Boston in 2012. He took the initiative and formed the Indian Academy of Dental Sleep Medicine and is its founder president. He is India’s first dentist trained in treating snoring, sleep apnea and migraine headaches with oral appliances. He has trained dentists across India in dental sleep medicine in 2013, along with Dr. Mark Abramson, USA, inventor of the OASYS Oral/Nasal Airway System™ to treat Sleep apnea and snoring. To complement his passion for Dental Sleep Medicine, Dr. Krishnan had advanced training in Neuro-muscular Dentistry at Las Vegas Institute for Advanced Dental Studies, Las Vegas, USA, where he acquired specialised skills to treat migraine headaches and Temporo-Mandibular Joint dysfunction. He is a member of International College of Cranio-Mandibular Orthopedics and has attended the international conference of ICCMO at Vancouver, Canada in 2011. Dr. Krishnan is a Visiting faculty in Dental Sleep Medicine at Comprehensive Sleep Disorder Center, Dept. of Neurology, Sri Chitra Tirunal Institute for Medical Sciences and Technology, Thiruvananthapuram. He is involved in clinical research in dental sleep medicine and treating sleep apnea patients with oral appliances. He is a member of Indian Dental Association.